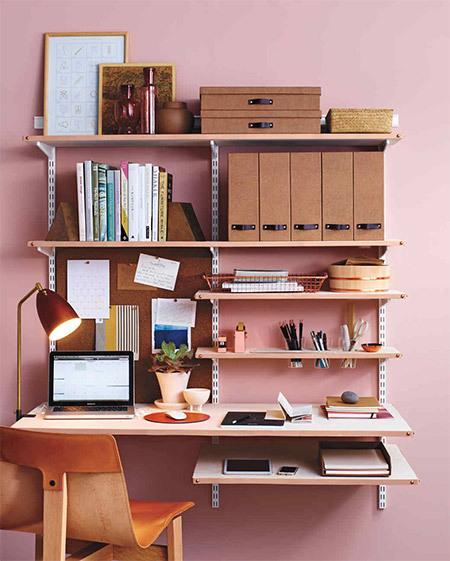 Buying shelving options at your local Builders is a great way to organise your home office, but sometimes you need to make a few tweaks for shelving to meet your needs. We took a standard shelf unit, with adjustable brackets and plain shelving, and drilled a few holes in the shelf to create cup holders. 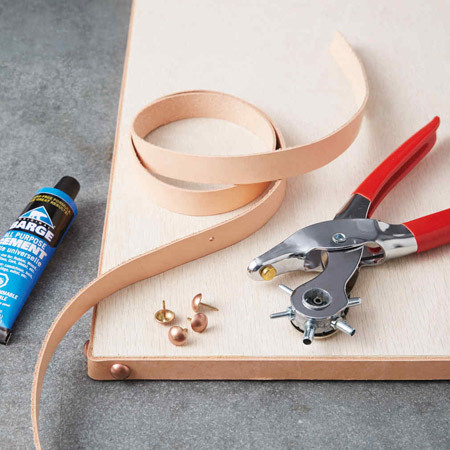 Cup holders are ideal for storage smaller items that you want to keep off your desk - but still within reaching distances, and drilling your own cup holders is not a difficult task if you have the right tools and accessories. 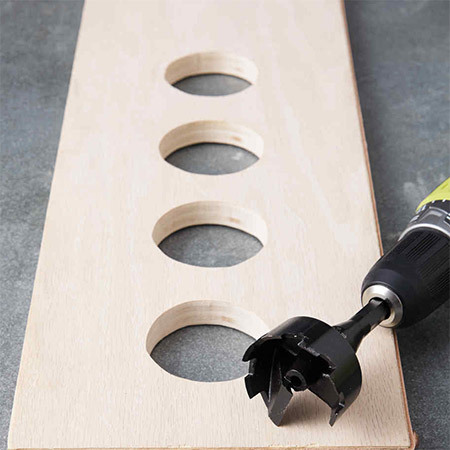 To drill small to medium holes in a shelf you can use either a spade bit, a MAD bit or a Forstner bit (shown below). If you want to make larger holes, say 100mm and upwards, you will need to use a hole saw. These bits are readily available at all hardware stores and you will find the Tork Craft brand in all Builders stores nationwide. To drill a perfect hole when using a spade bit, place a piece of scrap wood underneath where you are drilling. This will ensure that you have a clean exit hole. It is also important that you only use a sharp spade bit to reduce chipping around the edges of the hole. 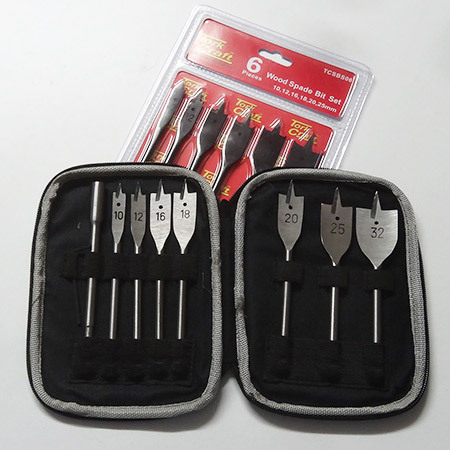 See these tips on using a spade bit. 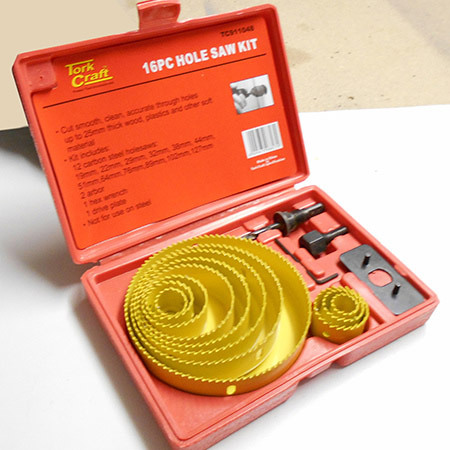 If you need to make larger holes in shelving, the Tork Craft Hole Saw Kit contains a selection of hole saws that can be fitted onto a drill. You will find tips for using a hole saw in our DIY section. 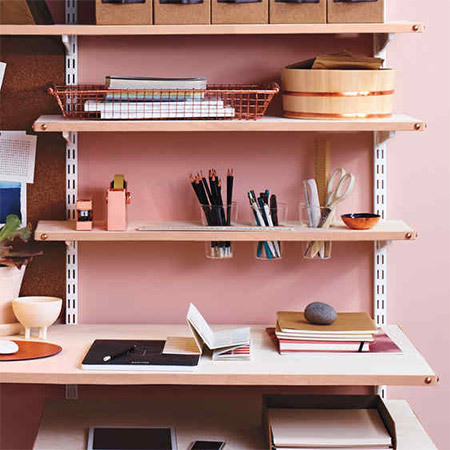 Another way to add a personal touch to ready made shelving is to add your own custom details. On this shelving unit is thin strip of leather was secured around the outside edge of the shelf and secured with decorative tacks. As an alternative you can fit decorative moulding or trim to give your shelving a unique look that makes it one-of-a-kind.